GENERAL DESCRIPTION DECEPTIVELY SPACIOUS & WELL PROPORTIONED Brick & Rendered SEMI DETACHED CHALET STYLE BUNGALOW ** THREE BEDROOMS (TWO with FITTED WARDROBES, TWO on GROUND FLOOR, ONE with FRENCH DOORS to REAR GARDEN) ** TWO ADJOINING RECEPTION ROOMS ** GENEROUS ACCOMMODATION of c. 800 sq. ft. with POTENTIAL for CONSIDERABLE FURTHER DEVELOPMENT of FIRST FLOOR ACCOMMODATION (SUBJECT to APPROVAL) ** LARGE LIVING ROOM with PICTURE WINDOW & FEATURE ADAM STYLE FIREPLACE ** FRENCH DOORS to DINING ROOM with LAMINATE FLOORING ** FITTED WHITE WOOD GRAIN EFFECT CATHEDRAL STYLE PANELLED KITCHEN ** CERAMIC TILED MODERN WHITE GROUND FLOOR WET SHOWER ROOM ** SOME MODERNISATION & IMPROVEMENT REQUIRED, hence the ATTRACTIVE ASKING PRICE ** Gas CENTRAL HEATING with COMBINATION BOILER ** White uPVC DOUBLE GLAZING ** CAVITY WALL INSULATION ** FRONT PATIO GARDEN / HARDSTANDING ** LONG GATED PAVER SETT TANDEM DRIVE for FOUR VEHICLES, CARPORT & DETACHED GARAGE ** THREE TIERED REAR LAWNED & PATIO GARDEN with SOUTH WESTERLY ASPECT for AFTERNOON & EVENING SUN ** CONVENIENT for LOCAL AMENITIES & COMMUTING to LEEDS & BRADFORD ** NO CHAIN SALE. This spacious and well located home will be of particular interest to families, professional couples and developers seeking attractive accommodation in a popular residential area with the potential to add value by improvements and further development. ENTRANCE HALL 9′ 0" x 3′ 0" (2.74m x 0.91m) max Georgian style panelled white wood grain effect composite entrance door with triple glazed patterned, bevelled and decorative leaded upper lights and spy hole. Central heating radiator. Light neutral decor. Beech style laminate flooring. Open plan to inner hall. Georgian style panelled white wood grain effect doors to living room and kitchen. LIVING ROOM 18′ 3" x 11′ 3" (5.56m x 3.43m) max White uPVC double glazed picture window to front with vertical blinds. Two central heating radiators. Feature arched rosewood veneer Adam style fireplace with polished marble insert and hearth and cast iron and brass style living flame coal effect gas fire. Sky digital / TV aerial points. Telephone point. Two wall light points. Co-ordinating light neutral and accent floral decor. Ceiling coving. Decorative ceiling rose. Georgian style panelled white wood grain effect door to hall. Georgian style glazed and pine panelled french doors to dining room. DINING ROOM 7′ 0" x 6′ 10" (2.13m x 2.08m) White uPVC double glazed window to front with vertical blinds. Central heating radiator. Meter box. Co-ordinating light neutral and accent floral decor. Beech style laminate flooring. Georgian style glazed and pine panelled french doors to living room with moulded architrave. Open doorway to kitchen. KITCHEN 8′ 4" x 6′ 10" (2.54m x 2.08m) max Fitted white wood grain effect cathedral style panelled wall and base units including drawers, wine rack, two diamond leaded glazed display cabinets, feature brass knobs, moulded cornice and pelmets. Light granite stone effect round edged worktops. Ceramic tiled splashbacks with feature tiles. Stainless steel single drainer sink. Gas and electric cooker points. Plumbing for automatic washing machine. Space below worktop for fridge. Double central heating radiator. Extractor unit. Display shelf. Light textured decor. Ceramic tiling to lower walls. Beech style laminate flooring. White uPVC double glazed window to side. Open doorway to dining room. Georgian style panelled white wood grain effect door to hall. 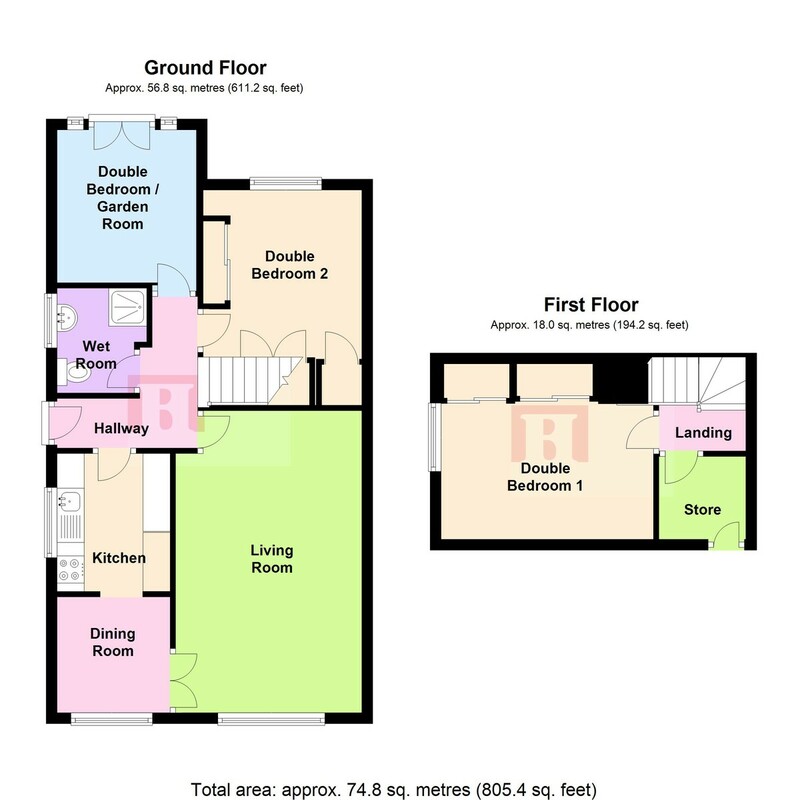 INNER HALL 8′ 6" x 3′ 4" (2.59m x 1.02m) max Open plan to entrance hall. Central heating radiator. Light neutral decor. Beech style laminate flooring. Access to first floor staircase. Access to part boarded insulated loft (not inspected or tested) with potential for further development (subject to necessary building regulation / planning approval). Georgian style panelled white wood grain effect doors to two ground floor double bedrooms and ground floor wet shower room. GROUND FLOOR DOUBLE BEDROOM 2 13′ 0" x 9′ 10" (3.96m x 3m) max White uPVC double glazed window to rear with outlook over garden. Central heating radiator. Fitted double wardrobe with sliding mirror doors including shelving. Built-in double wardrobe with white panelled doors including double hanging space and power point. Light neutral decor. Ceiling coving. Georgian style panelled white wood grain effect door to inner hall. GROUND FLOOR DOUBLE BEDROOM 3 / GARDEN ROOM 9′ 9" x 8′ 4" (2.97m x 2.54m) max White uPVC double glazed french doors to rear garden with two double glazed sidelights. Central heating radiator. Sky digital / TV aerial points. Space for bedroom furniture. Light modern decor. Varnished pine skirting boards. Georgian style panelled white wood grain effect door to inner hall. GROUND FLOOR WET SHOWER ROOM 6′ 4" x 5′ 5" (1.93m x 1.65m) max Modern white three piece suite with chromed fittings. Shower stall with ‘Mira’ electric shower, movable patterned perspex screen doors, shower curtain rail, foldaway seat and twin grab rails. Pedestal wash hand basin with mixer tap, pop-up waste and tiled splashback. Close coupled WC with pine style seat. Central heating radiator. Extractor unit. Ceramic tiling to walls with decorative tiled border and feature tiles. Wet room flooring. White uPVC double glazed patterned window to side with tiled sill and reveals. Georgian style panelled white wood grain effect door to inner hall. STAIRCASE AND LANDING 5′ 6" x 2′ 6" (1.68m x 0.76m) Varnished pine banister rail to half return staircase. Infilled balustrade to landing. Light neutral decor. Georgian style panelled white wood grain effect doors to master double bedroom and storeroom. MASTER DOUBLE BEDROOM 12′ 10" x 10′ 6" (3.91m x 3.2m) max White uPVC double glazed window to side with wooded outlook and long distance views. Double central heating radiator. Two fitted double wardrobes to one wall with sliding doors, shelving and double hanging space. TV aerial point. Telephone point. Light textured decor. Georgian style panelled white wood grain effect door to landing. N.B. the adjacent part boarded loft and eaves storage space on either side of the room, together with the storeroom, afford the possibility of considerable further development and expansion of this room (subject to necessary building regulation / planning approval). STOREROOM 5′ 7" x 4′ 10" (1.7m x 1.47m) Fitted shelving. Central heating radiator. Wall mounted gas combi instant hot water boiler. Light textured decor. Access to eaves storage. Access to roof void. Georgian style panelled white wood grain effect door to landing. EXTERIOR REAR Three tiered lawned and patio garden with south westerly aspect for afternoon and evening sun. Brindled paver set path and terrace patio with pebbled borders. Security sensor light. Flagged steps with metal handrail up to lawn with riven stone effect flagged path and log roll edged rose and shrubbery borders. Feature circular riven stone effect flagged terrace with pebbled border and trellised screen. Feature pebbled border with water feature. Riven stone effect flagged steps with metal handrail up to pebbled patio terrace with flagged seating area and trellis screen. Capped stone rear boundary wall. Wood lap fencing. DRIVE, CARPORT AND GARAGE 16′ 9" x 8′ 2" (5.11m x 2.49m) max Decorative metal double gates to long brindled herringbone paver set tandem drive with capped stone effect block wall and parking for up to four vehicles. Timber framed carport with polycarbonate panelled roof and white uPVC double glazed patterned windows to side. Security sensor light. Exterior cold water tap. N.B. disabled access ramp to be removed. Detached brick built pitched roof single garage with metal ribbed up and over door, security sensor light, security glazed side window, storage cupboards, eaves storage, power and light. EXTERIOR FRONT Herringbone paver set patio garden with well stocked alpine and shrubbery borders (potential as additional parking area). Security sensor light. Capped stone effect boundary wall. White uPVC soffits and fascias. Georgian style panelled white wood grain effect composite entrance door with triple glazed patterned, bevelled and decorative leaded upper lights and spy hole. Central heating radiator. Light neutral decor. Beech style laminate flooring. Open plan to inner hall. Georgian style panelled white wood grain effect doors to living room and kitchen. White uPVC double glazed picture window to front with vertical blinds. Two central heating radiators. Feature arched rosewood veneer Adam style fireplace with polished marble insert and hearth and cast iron and brass style living flame coal effect gas fire. Sky digital / TV aerial points. Telephone point. Two wall light points. Co-ordinating light neutral and accent floral decor. Ceiling coving. Decorative ceiling rose. Georgian style panelled white wood grain effect door to hall. Georgian style glazed and pine panelled french doors to dining room. White uPVC double glazed window to front with vertical blinds. Central heating radiator. Meter box. Co-ordinating light neutral and accent floral decor. Beech style laminate flooring. Georgian style glazed and pine panelled french doors to living room with moulded architrave. Open doorway to kitchen. Fitted white wood grain effect cathedral style panelled wall and base units including drawers, wine rack, two diamond leaded glazed display cabinets, feature brass knobs, moulded cornice and pelmets. Light granite stone effect round edged worktops. Ceramic tiled splashbacks with feature tiles. Stainless steel single drainer sink. Gas and electric cooker points. Plumbing for automatic washing machine. Space below worktop for fridge. Double central heating radiator. Extractor unit. Display shelf. Light textured decor. Ceramic tiling to lower walls. Beech style laminate flooring. White uPVC double glazed window to side. Open doorway to dining room. Georgian style panelled white wood grain effect door to hall. Open plan to entrance hall. Central heating radiator. Light neutral decor. Beech style laminate flooring. Access to first floor staircase. 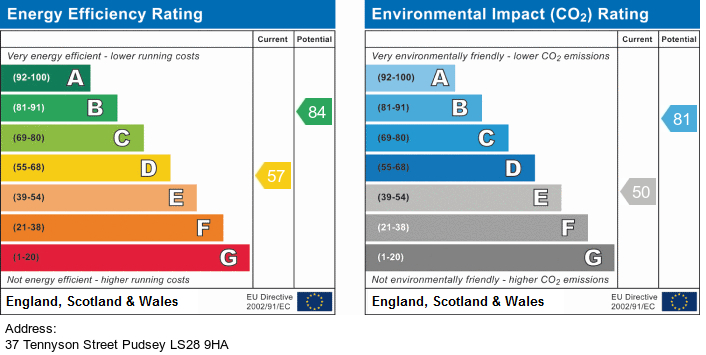 Access to part boarded insulated loft (not inspected or tested) with potential for further development (subject to necessary building regulation / planning approval). Georgian style panelled white wood grain effect doors to two ground floor double bedrooms and ground floor wet shower room. White uPVC double glazed window to rear with outlook over garden. Central heating radiator. Fitted double wardrobe with sliding mirror doors including shelving. Built-in double wardrobe with white panelled doors including double hanging space and power point. Light neutral decor. Ceiling coving. Georgian style panelled white wood grain effect door to inner hall. White uPVC double glazed french doors to rear garden with two double glazed sidelights. Central heating radiator. Sky digital / TV aerial points. Space for bedroom furniture. Light modern decor. Varnished pine skirting boards. Georgian style panelled white wood grain effect door to inner hall. Modern white three piece suite with chromed fittings. Shower stall with 'Mira' electric shower, movable patterned perspex screen doors, shower curtain rail, foldaway seat and twin grab rails. Pedestal wash hand basin with mixer tap, pop-up waste and tiled splashback. Close coupled WC with pine style seat. Central heating radiator. Extractor unit. Ceramic tiling to walls with decorative tiled border and feature tiles. Wet room flooring. White uPVC double glazed patterned window to side with tiled sill and reveals. Georgian style panelled white wood grain effect door to inner hall. Varnished pine banister rail to half return staircase. Infilled balustrade to landing. Light neutral decor. Georgian style panelled white wood grain effect doors to master double bedroom and storeroom. White uPVC double glazed window to side with wooded outlook and long distance views. Double central heating radiator. Two fitted double wardrobes to one wall with sliding doors, shelving and double hanging space. TV aerial point. Telephone point. Light textured decor. Georgian style panelled white wood grain effect door to landing. N.B. the adjacent part boarded loft and eaves storage space on either side of the room, together with the storeroom, afford the possibility of considerable further development and expansion of this room (subject to necessary building regulation / planning approval). Fitted shelving. Central heating radiator. Wall mounted gas combi instant hot water boiler. Light textured decor. Access to eaves storage. Access to roof void. Georgian style panelled white wood grain effect door to landing. Decorative metal double gates to long brindled herringbone paver set tandem drive with capped stone effect block wall and parking for up to four vehicles. Timber framed carport with polycarbonate panelled roof and white uPVC double glazed patterned windows to side. Security sensor light. Exterior cold water tap. N.B. disabled access ramp to be removed. Detached brick built pitched roof single garage with metal ribbed up and over door, security sensor light, security glazed side window, storage cupboards, eaves storage, power and light.